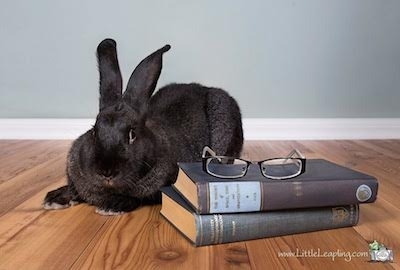 Loki is a 1 year old Flemish Giant bun who is super curious about his world and loves to give kisses. Loki weighs in at 13.8 lbs and has 7 inch tall ears; he isn't quite done growing yet. He is neutered, loves chew toys, knows/responds to his name and he is quickly picking up on his litter box habits. Loki needs a home that can provide him lots of attention and would be great for a retired individual/couple, for someone who works at home, or someone who works part time as he demands lots of attention. He would do best in a home without young children as he has a habit of tugging on clothing to get your attention for head pets or treats and occasionally he can accidentally nip a tiny bit of skin under the clothing, but it isn't intentional. He will also need a home that can provide him with a very large custom NIC (neat idea cube) cage or a cage made from at least 2 large X-pens, as there isn't a plastic bottomed one made that he will even come close to fitting in comfortably long term. He also requires a large space so he can roam and explore outside his cage.